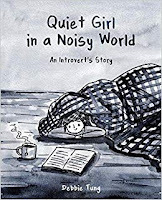 Debbie Tung's Quiet Girl in a Noisy World is somewhat reminiscent of Sarah Anderson's or Allie Brosh's comics in that they take comedic approaches to their own lives, especially focusing on their insecurities. As it happens, their insecurities are also my insecurities, so if anyone wanted to know me better (anyone? no?) I'd safely recommend any of these. 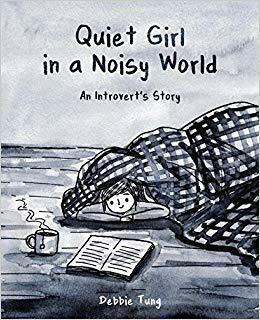 Tung's book is subtitled An Introvert's Story and herein lies the source of most of her insecurities. The book however explores how society has made her, and me, insecure about that, convincing us that it's a weakness and something to be ashamed of. However, she still leads a successful life, has a healthy relationship (her extroverted spouse reminded me of my own), and as she starts to discover, there are plenty of introverted people with very similar traits and just knowing that can be a revelation and a source of comfort. This is why the book is so important. Unsurprisingly, the book is in black and white with grey watercolours. Not goth necessarily, just no need to be flashy.